1. Do I have to be a member of SMSA to participate in Junior Sailing Camps? 2. How old does my child need to be to participate? 3. How do I know if I am enrolled in the class? 4. What kinds of sailing apparel should I have for my child? 5. Where can I get sailing clothes? 6. What types of sunscreen and sun protection should I use? 7. My child has sailed before on a keelboat, with the scouts, at camp, etc. What class would be best? 8. When do I need to start thinking about buying a sailboat for my child? 9. Can I come and watch my child learn to sail? 10. Will my child be safe if there is inclement weather? 11. Do I have to own a boat to be in the program? 12. How well does my child have to swim? 13. What is taught in each of the classes? 14. I lost my... ? Could you let me know if you see it? 15. Can I leave my children at the Yacht Club while they are not in class? 16. Who teaches SMSA's classes? 17. What boats do we use to teach sailing? 18. 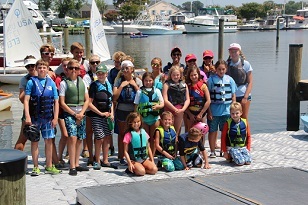 How can I or my child become a member of Southern Maryland Sailing Association? 19. Can my child sign up for more than one session? 20. What does my child need to bring? 21. We've registered for a course and can no longer attend - can I get a refund? No. The programs are open to SMSA members and Non-members. Children of families who aren't members can join as Junior members of SMSA (included in the non-member course fee). Classes are available starting at age 5. Sailors must meet the age requirements for each class by the first day of the session. When you submit your online registration form you will immediately receive an email response from us confirming the receipt of your application. All sailors must have their own US Coast Guard approved PFD (lifejacket) - minimum Type III rating. Additionally, all sailors should be well equipped with sun protection including sunscreen lotion, hat, sunglasses, and long sleeved t-shirt. Sailors ideally should also have a spray top (preferred), windbreaker or rain jacket to keep them dry if there is rain or splashing while sailing. Clothes should be able to dry quickly and sailors should have extra dry clothes to wear after sailing. Bring a towel! You can get sailing clothes at West Marine, Walmart, Targe, K-mart, or at sports outlets like REI or EMS. You should be looking for clothes that offer good skin coverage and dry quickly. Sailors should buy waterproof sunscreen that is SPF 30+. It is important to find a sunscreen that doesn't burn the eyes. When children sweat sunscreen will end up in their eyes. Nothing can ruin a great day on the water faster than a sunburn. 7. My child has sailed before on a keelboat... with the scouts... at camp, etc. What class would be best? Sailors with little or no experience steering a boat should enter a beginner class. Students who have previous experience sailing a small boat by themselves can enter an intermediate class. If your child is an experienced sailor the Advanced Teen Racing class may be for them. Every family is different, but if you're child really likes sailing, one way to get the most out of the sailing experience is to have a boat that is your own. 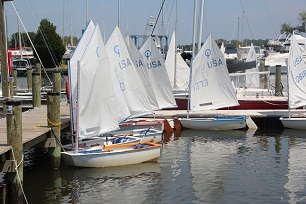 SMSA Junior members are able to utilize the SMSA sailboats used for class with adult supervision. Ask the instructor or email junior@smsa.com for more information. Parents are welcome to observe their child's class from a distance. History has shown many young sailors deal with the challenges of learning to sail best without the distraction of having a parent present. We always practice safe procedures at SMSA. We do not cancel class on rainy days. Sailors should be prepared to sail as usual and they should be equipped with foul weather gear. Bring a change of clothes! No. Use of club boats is included in the class fee. They need to be secure and comfortable in the water. Swim test is 75 ft swim any stroke, 2 minute tread water, and putting a life-jacket on in the water. This is done in the water at the dock behind the clubhouse. The SMSA program emphasizes safety, learning, and foremost FUN, by teaching sailing, seamanship and navigational skills, plus an introduction to racing. Our program helps participants develop self-reliance, self regulation, sportsmanship, knowledge and respect for the environmnet while ensuring boating safety awareness. With a combination of classroom time and on the water time, classes are designed to teach the basic skills of sailing to beginners and to help hone the skills of more advanced students. Yes, if it is clearly marked with your name. Clothes and especially life-jackets should have full name in a conspicuous place. You should also label your name on gear with indelible ink. 15. Can I leave my children at the Sailing Club while they are not in class? Our courses are taught by US Sailing certified instructors which includes First Aid and CPR training. The SMSA learn to sail program uses Optimists and Sunfish sailboats. The Advanced Teen Racing Program utilizes Club FJs. Family and Adult Learn to Sail uses Sunfish and small keelboats (ex: Holder 20). Contact our membership chairperson at membership@smsa.com or visit the membership page of the SMSA website. Yes, many students participate in multiple sessions. This is a great way to improve skills. 10. Sunglasses are a good idea with strap. 11. Helmet (bicycle or skateboard style helmets are good). Required for Kids Intro to Sail and Beginner Dinghy Sailing. Personal Flotation Devices (life jackets) will be worn any time the participant is in/on the water or on the dock, except for during the swim test. It would be a good idea to have each of the participant's articles properly marked with their name. SMSA will not be responsible for lost or stolen articles. You are entitled to a refund of the course cost (less applicable processing fees based on method of payment) if a refund request is received in writing more than 30 days prior to the course start date. Refund requests must be emailed to treasurer@smsa.com.